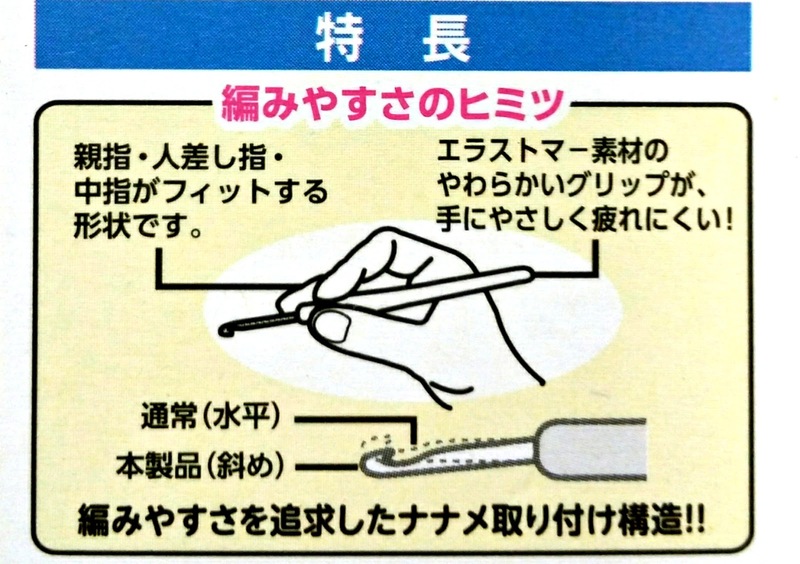 Stitch Story: A Tale of Two Japanese Crochet Hooks! 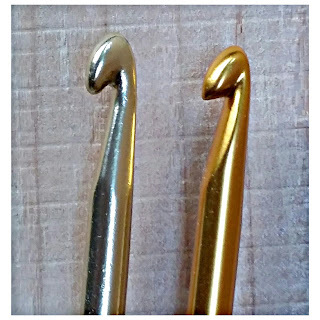 A Tale of Two Japanese Crochet Hooks! Recently I was at Daiso, which is always so much fun! There is nothing like aisles and aisles of interesting things that you have never seen before, almost all priced at $1.50! I read that they produce 1000 new items a month, and every time I go there I find some little treasure. 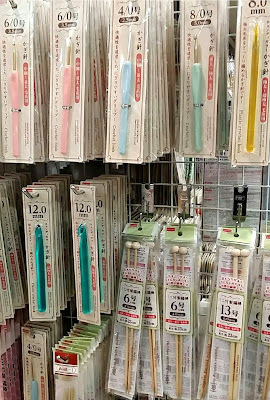 This time I found their section of crochet hooks and knitting needles. I was intrigued by their ergonomic crochet hooks. I am a huge fan of Tulip Etimo hooks, and use them almost exclusively, but since these hooks are available locally, I thought I would give them a try! 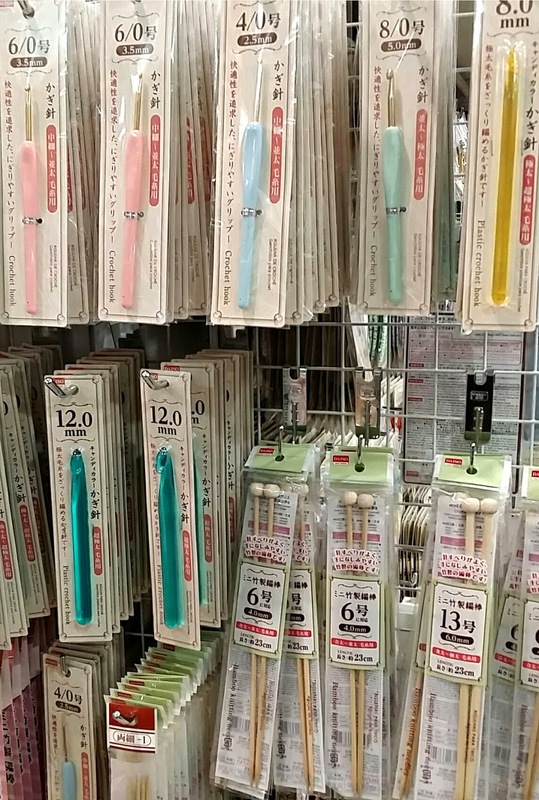 They have a large selection of ergonomic and acrylic crochet hooks as well as bamboo knitting needles. The first thing I compared when I saw the two hooks side by side was the head of the hook. The hook on the left is from Daiso, and the hook on the right is from Tulip. 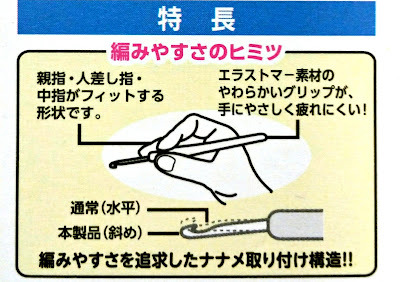 You can see that the Daiso hook is rounded at the top and has a less defined throat. The Daiso hook also isn't as smooth as the Etimo, and has less of the hook of the hook exposed. They both have silicone handles, but again I found the Etimo to be smoother. The shape of the Daiso handle is triangular, which is quite different from the Etimo hook that has a relatively flat top and rounded back. I didn't realize it until I tried the Daiso hook, but the Etimo handle is much more universal due to its shape. I hold my hook two different ways, but not exactly this way, so it would take me some time to get used to it. I really like the large flat thumb rest on top of the Daiso hook, and think it might be nice if the Etimo's was a little more like it. Overall, the best thing about the Daiso hook is its price: $1.50 in the US and about $1.95 in Kuwait, vs. $10.63 for the Etimo. I believe the old addage "you get what you pay for" applies here. I think I would be able to recommend the Daiso hook more highly, if I held my hook the way they intended you to. This test really highlights the importance of design! If use the pencil hold and have a Daiso near you, give these hooks a try to see how you like them! Thank you for your comment Elizabeth! I hope you will become a regular visitor to my blog! I have been down many avenues of design, and am now happily working as a fiber artist. This blog is about crochet design, and my adventures in fiber. Please stay tuned, for my Stitch Story. Mixed Media and Another Use for Surface Crochet! Working With Fiber: Modern Weaving! Crochet Designers Blog Tour, Day 1: A Fun Way to Add Color to Crochet! A New Use for the Charming Bracelet Pattern! Crochetville 2017 Designer Blog Tour!